Just a quick hello and to say that your 'announcing a winner ensemble' is super groovy. I believe that is the most delightful random number generator I've ever seen. i am now thinking my chickens may not sleep well tonight or ever again... knowing the existence of a crockpot in the nearby vicinity could stop them getting any 'shut eye' ever again! 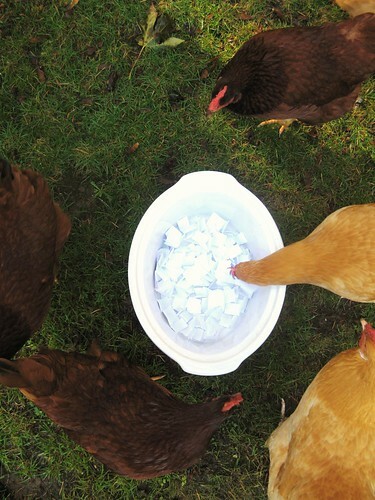 ha ha ha those chickens picking the winner is hilarious! LOL, definitely the best random generator EVER in the history of giveaways!!! Love it! tif, i have been thinking recently about getting some "urban"chickens and i wondered if they are difficult to have and to raise...are they? i would love to know if you have any advice for starting such a brood... please email me if you can lmharrison24@hotmail.com. i love reading your blog and your photos are gorgeous! i say they are truly 'easy peasy' to keep, whilst they are chicks it takes a lot of care and time, but once they are grown up, i do believe chickens are no trouble at all. i especially like the fact my chickie peas think i am the mother hen... it would be quite true to say if i could only keep one type of critter then i think it would have to be chickens. 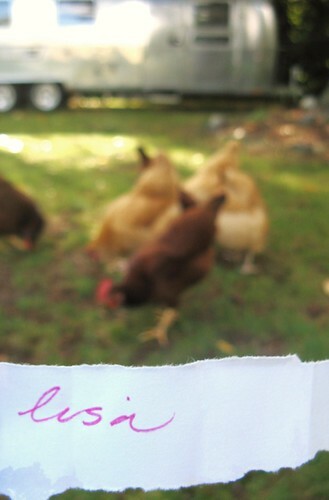 I raised chickens for years and loved them immensely. They are easy. I just wish I had thought of using them as random giveaway pickers! Tif- you are a hoot. I hope you had a great week with lots of fun girl time! Congrats to Lisa on winning the gorgeous bunting! I'd like to echo Tif's sentiments on the chickens... We got ours about a year and a half ago (we have 20-some) and they're truly an easy animal to care for. I'm a bit of a city slicker and although we live in the country now, I was a little worried at first when my husband came home with so many. But they really have been fun and are fairly 'low-maintenance' as far as animals go. 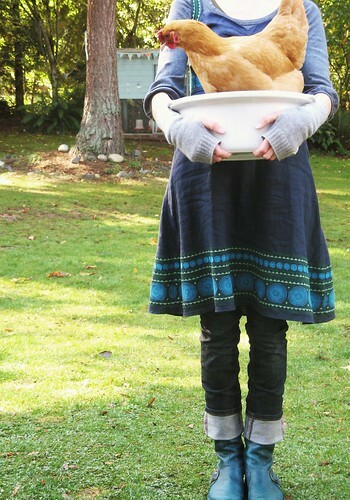 Oh I think chickens would be a marvelous addition to the garden. Just have to convince the hubby now. I've tried and failed before. I can't believe you actually let your hens peck out the winner! And boo hoo it wasn't me!! But I've rescued a few doilies that my mother was selling last weekend, and she didn't even consult me first. So I shall be able to whip up something doilyish now too. Ah Congratulations to Lisa - and what a lovely comment she left too! 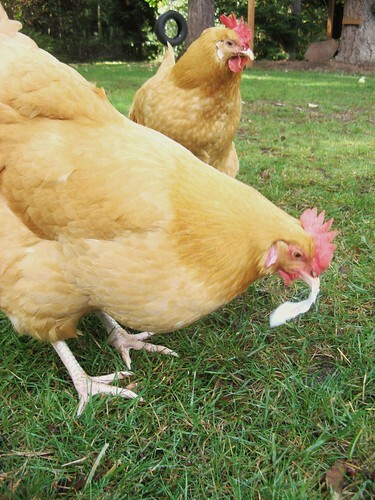 Thanks for sharing the fun photos of the chickens and their crock pot dipping! I agree that they are very amiable and picturesque creatures, but I think it is best to have them in quantity and not give them names if you want to free range them. We have lost two (out of 23) recently to Mr Fox, and it is upsetting, but not so bad as when we lost two special friends who lived just by the back door. It is always important to remember the time of sunset every day and make sure you are at home to shut them up. Or am I being horribly parochial and ignorant and this is not an issue in your neck of the woods? oh yes, mr coyote is a problem in our neck of the woods, amongst other predators, day or night. Lovely outfit! Is that 100% thrift style? I'm seriuosly thinking about taking the challenge!!!! I use my doxie as my 'random number generator'. Congrats to Lisa on her new garland! "Food that is forever stamped on my heart as what "home" and holidays taste like" ...what a lovely way to phrase it. And I do adore a nicely turned phrase! I am MORE than slightly envious of Lisa winning the giveaway as I would REALLY have liked to have it - as would many more of your readers I suppose! Perhaps I might actually try and make one myself now there isn't the opportunity to get it - unless of course Lisa doesn't actually want it when I'll be there in the queue to relieve her of it.